I am not even sure how to begin this post, so I guess I will just state the obvious and move on from there: our little Scamp is completely totaled. On Monday as we were driving down the highway our car's back tire blew, causing us to violently fishtail. I've never been in that kind of situation before, but I quickly discovered that with a flat tire it is impossible to get traction or regain control once it's gone. I did my best to slow down without getting hit by the semi bearing down on us while simultaneously trying to wrestle the bucking car and trailer over to the emergency pull off. While I was so fortunate to be able to avoid a collision with the semi and any other traffic, the fishtailing was ultimately too much for our poor little camper. Instead of taking us with it the Scamp let go of the hitch and rolled several times into the ditch. Though I didn't actually see the trailer flip over, Will did and the way he describes it just makes my heart sink. According to him it was like watching a tornado just lift it up and smash it into the desert. It makes me so sad to think that our Scamp that is now completely destroyed and gone, being that we, and its previous owners, loved so much. We had both imagined having the little guy for years to come and creating so many wonderful memories in it. It just feels so awful losing our sweet little trailer, especially at the beginning of what was suppose to be a big fun trip. We're looking at the positives, though, and we feel lucky that we got to spend at least one fun weekend camping in it out in CA. 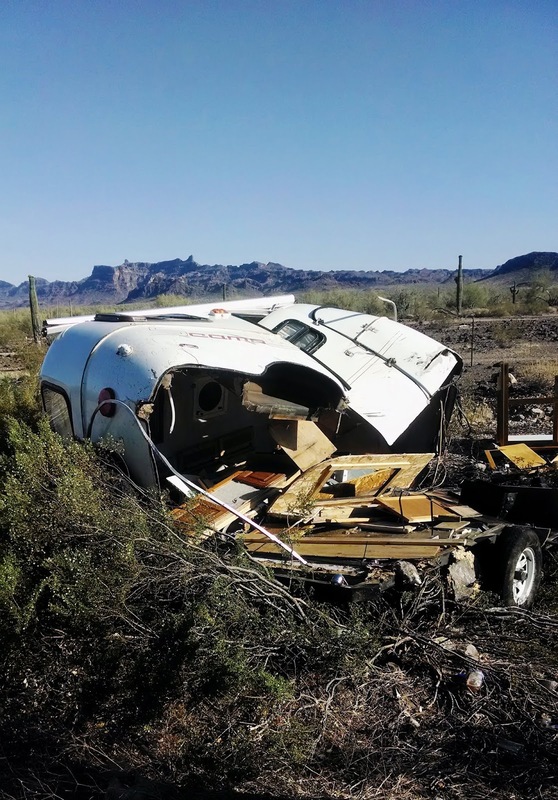 I am really hoping we will be fortunate enough to find another little fiberglass trailer, but I have a feeling that even if we do it will never completely fill the void left by this horrible accident. This little guy was my very first camper and I just fell head over heels in love with it. Tuesday we drove almost two hours to the salvage yard in the middle of the desert to figure out what, if anything, was savable. I thought that having a night to sleep and kind of decompress would help make seeing the crumpled Scamp not as awful, but sadly it was just as bad, if not worse. I think after the crash I was just so shocked by adrenaline that it didn't sink in how horrible the Scamp looked. Regardless, I was, and still am, focused on how lucky we were that the whole accident didn't turn out worse. So here we are, back in Phoenix, Scamp-less, and our West Coast Extravaganza put on hold indefinitely for the time being. And while I still get a shaken up at the thought of our little camper so destroyed, I am so grateful to have Will working on his computer in front of me, Wigs sitting on her window seat, and Sylvester sitting in my lap purring away. The Scamp is ultimately replaceable. I'm so glad you guys are alright. That sounds like a seriously scary situation and I'm sorry for your camper! I know you were looking forward to your trip but at least you're being optimistic about it all, I think that counts for something. Oh my goodness! I'm so glad that you guys are okay. Ah man Amanda, that's such a bummer. :( I'm SO glad you are all okay. Oh my gosh - thank goodness you're all OK! What a terrifying experience. I'm so sorry that you lost the Scamp, but also just glad you walked away unscathed. Aw, Amanda, I'm so sorry! I'm just glad you are all ok!! Oh wow that is such a horrible situation. I'm glad you're ok though and hopefully you can continue your trip in the near future! But seriously..that photo...ugh. I'm so happy that you guys are safe! I'm so sorry that this happened so quickly into your tripping (or at all, really!) but thankful you are both safe + Scamps can be replaced (in theory, though not always in heart/mind) but people cannot! Oh no! I'm so sorry:( I'm glad you guys are ok. What a scary situation and sad to see the aftermath. Hang in there and hope you have a better weekend. I'm so sorry guys! Glad that you are safe though and that you got through well of that situation, I think I would have panicked (not the best driver out there :S) Wish you will find another camper soon (it must be sad) and the fun trip (your itinerary is awesome) is not postponed for too long. hugs!!! I'm just so very glad that you guys are okay. This is so scary and sad. oh gosh, really heartbreaking to hear about this. I am so glad you lots are ok though. Ooo that's so sad! But I'm glad that you are OK. Thank goodness you are all okay. So sorry this happened to you. Hang in there. My heart was in my throat when I saw that picture because the first thought in my head was of Wiggs and Sylvester since they sometimes ride back there. Thank goodness they weren't and everyone is safe! It truly does look like a tornado hit it. This is actually why we never let the cats ride in the camper when we are traveling. So happy we always have then up in the car with us! I am so sorry--this is terrible! So glad you're safe, though. Oh that is so sad! But like you said, the pieces that are the most important are still safe with you. So sorry for the loss of your trailer! Amanda! I'm so sorry to hear about this! I've been behind on blogs and was shocked to see this happened. I'm so glad you guys are ok, that would be such a scary situation and you handled it so well. So sorry about your camper! I'm so sorry to read about Scamp, but super glad you and your family is okay.